Dow Chemical Solar shingles that any roofer can install. Dow Chemical has unveiled a residential roof shingle in the form of a solar panel designed to be integrated into asphalt-tiled roofs. 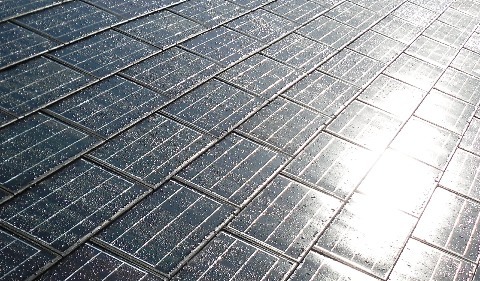 Jane Palmieri, managing director of Dow’s Solar Solutions unit, said the Powerhouse thin-film shingle slashes installation costs because it can be installed by a roofer who is already building or retrofitting a roof. “As a roofer is nailing asphalt shingle on roof, wherever the array needs to be installed he just switches to solar shingle,” said Ms. Palmieri, who said the solar singles are similarly attached to the roof with nails. An electrician is still needed to connect the completed array to an inverter and to a home’s electrical system, but unlike conventional solar panels that must be wired together, the solar shingles plug into each other to form the array. Dow plans to begin test-marketing the solar shingle in mid-2010, initially targeting new-home construction. Ms. Palmieri said the market could be worth $5 billion by 2015 and noted that 90 percent of homes in the United States use asphalt shingles. Dow designed the shingles, which will initially be manufactured at the company’s Midland, Mich., facility. Global Solar of Tucson, Ariz., is supplying the thin-film solar cells. Thin-film has generally not been used for residential systems because of its relatively low efficiency – Global Solar’s cells are 10 percent efficient. That means a larger array is required generate the same of amount of electricity as conventional solar panels. But Dave Parrillo, the senior research and development director for Dow Solar Solutions, said the solar shingles can offset between 40 percent and 80 percent of a home’s electricity consumption. Ms. Palmieri said a solar shingle array is 10 percent to 15 percent cheaper than a standard rack-mounted solar panel system and about 40 percent less expensive than competing building-integrated photovoltaic products. “Our objective is to prove that this can be a mainstream adopted product,” she said.